As most avid readers know, my family and I spent the last 3 years living in the Florida Panhandle, far from climbing. In May, we made it back to Colorado, and our home in the mountains. These last 3 years have been psychologically challenging, and it seemed to be a massive struggle just to maintain my climbing performance, let alone improve. I always planned/hoped that the training I accomplished in Florida would manifest itself when I was finally able to live closer to climbing. So this fall is our first full season back in the mountains, with good conditions. We trained hard and trained well, and I picked out a project that would represent a significant milestone for me; Prime Time to Shine, a 5.14b (8C) at the Primo Wall in Clear Creek Canyon, CO. 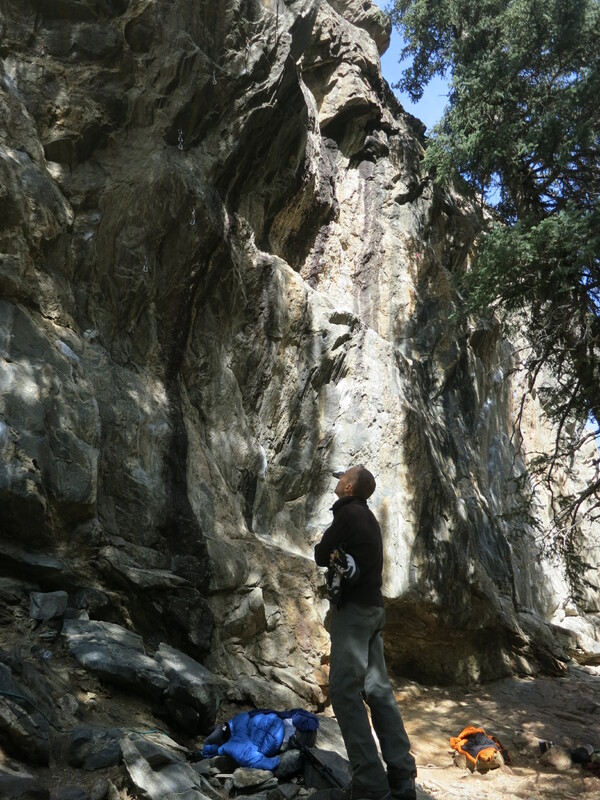 This is ironic, and I must “eat a little crow”…I have been known in the past to dismiss Clear Creek as an unworthy choss pile of a climbing area, and while that description holds for certain routes in Clear Creek, there are many crags that are truly world-class. The Primo Wall is one of those crags. I was wrong, I admit it. I started working the route in late September by working the route Primeval (5.14a) that shares the start and the first crux. I sent Primeval a couple weeks ago, and discussed that process in a previous post. I used Primeval as a stepping stone goal to help build up my redpoint-ing technique. 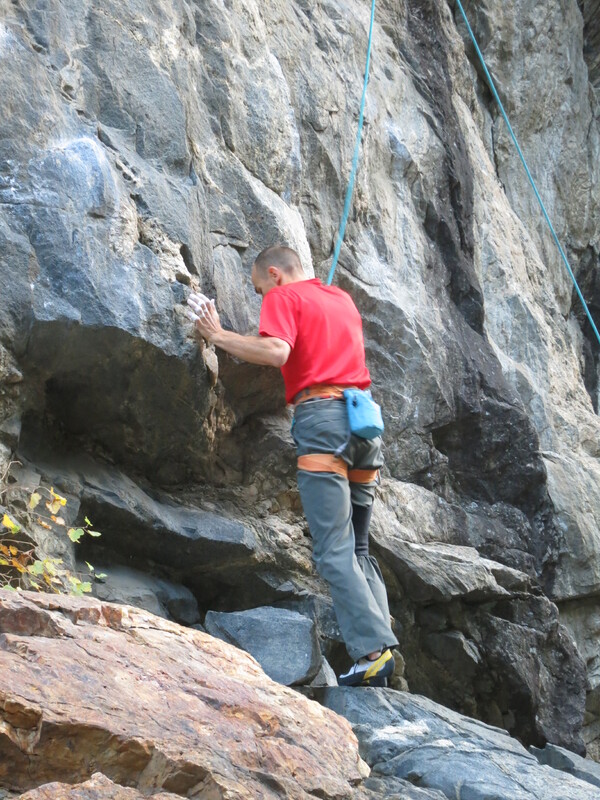 We discuss this in The Rock Climber’s Training Manual, and I really recommend it; starting each season with some “easier-for-you” climbs to get back in your sending groove, and build confidence for more daunting projects. The alternative is often starting on something too-hard, not experiencing any success, and eroding your confidence. Over the last week the weather has changed a lot, getting much cooler at night, but still warm in the day. The Primo Wall gets sun at about 10:30, and I had been working the route in the early morning before sunhit. The cooler temps posed a problem because it was borderline too-cold (high 30s) to climb before sunhit, but too hot after. The upper crux boulder requires a long lockoff/reach off of a terrible right hand sloper, so conditions are critical. I needed to figure out if I should try my redpoint before or after sunhit. Last Monday I had a great day, one-hanging the route twice and making new highpoints with great linkage. I thought I had a chance to send my next day out, but I miscalculated on the conditions and, for the first time since I started trying to redpoint, I was falling at the first crux…I was backsliding! This was very discouraging at first, but I reminded myself to blame the conditions and not be too hard on myself. This past Saturday I had another chance, with cool overnight lows forecasted. We stayed with Mark and Kate so that we could get an early start, and I warmed up in the “Lazy H” (Mark’s barn/climbing gym). It’s nice to have this option when it’s 6:00 AM, and it’s still dark outside (and cold!) Plus, the kiddos can sleep an extra couple hours because we don’t have to warmup at the crag as much. That said, I had learned on my previous day out that going straight from the gym to the project is a bad strategy on a cold day because your fingers aren’t acclimated to the cold. This time, I decided to take a warmup lap on “Movin’ Out”, a super-techy 12b at Primo. This is a great warmup in the sense that it’s not sharp, but it has small holds that you have to bear down on, and it’s very techy (awkward), so it forces you to turn on your technique. Because of this warmup, I started my first burn a bit later than normal (9:00 instead of 8:00), but it was worth it. I think my thermometer registered 42 degrees, and it felt perfect. I fired through the first crux with confidence, and only had a slight chill in my fingers when I reached the sloper rest. 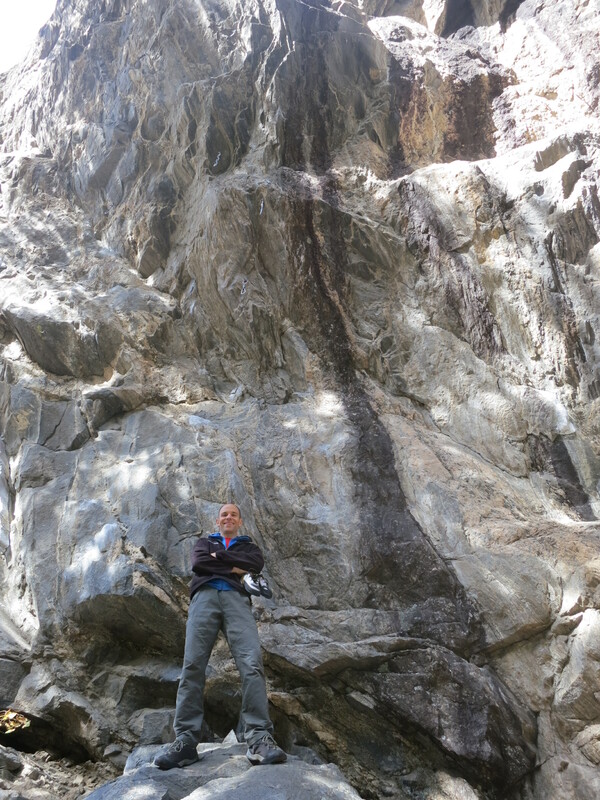 I warmed them a bit on my neck, then headed into the second crux – the crux of “Shine”, and the redpoint crux. I grabbed the small left hand crimp, and the bad right hand sloper, rocked over my left foot, and this time my right hand didn’t pop off the sloper like it did last time. I latched the next hold (a sharp pegmatite crimp) and was a little shocked. A couple foot moves, a gaston, and I setup for the final dyno….I hit the hold, and fell off. My fingers weren’t able to close on it in time to stick it. I think it was a combination of cold and pump. I was stoked for a new highpoint, but disappointed to be so close to victory and literally not being able to grab it. I lowered and readied my mind for another burn. I knew sun would hit at 10:30, so I had a bit over an hour to rest. I belayed Janelle on her project (Sucking my Will to Squeeze – 13a), and thought about my effort. I wondered if I really was trying my hardest on that move? On a hard power-endurance redpoint, I go to a lot of trouble to stay relaxed and avoid over-gripping, but sometimes you need to do just that, sometimes you need to squeeze like hell, especially when it’s the last move you’re hanging onto. Right there I made a blood oath that if I ever got to that sharp crimp again, I would squeeze the blood right out of my tips to hang on, if I had to. Psyching up to send, at the base of Prime Time. I started my next go at about 10:25. It was a couple degrees warmer, and I wasn’t as rested as I would have liked. It showed on the first crux, and I had to dyno a couple moves that are usually static, but I got through and made it to the halfway sloper rest. I was very aware of my performance — really “in the zone” as they say. I did a great job of consciously relaxing my grip and staving off the pump, which was critical because I was still “hungover” from the previous burn. I left the sloper and setup for the final crux. There is a long cross-over move to a sidepull that is pretty powerful, and that is when the pump started to hit. I turned up my breathing and made a concerted effort to relax my grip. Just then, I realized the sun was out! I setup on the small crimp and sloper, did the rockover and hit the sharp pegmatite crimp. This time I squeezed the $h!t out of that thing!!! As a result, I made the next move nearly static, moved my foot and hit the dyno, with no doubts whatsoever. I had rehearsed a long shake here, but I didn’t think I needed it. I made the clip, and continued up the 5.12+ to the anchor, forcing my breathing and relaxing. In the introduction to the Rock Climber’s Training Manual we discuss how there are many elements to difficult climbing, and that many times your life’s circumstances (weather, partners, job, family, etc) prevent you from getting the time at the crag you need to make tangible improvements. This may happen even though you are physically or technically improved as a result of training. These situations are incredibly frustrating because you put in the hard work, but don’t get the reward. The past three years in Florida was one of those periods for me. I struggled mightily just to maintain, and many times I felt I was regressing. I was only able to get on rock for about two weeks each season, and just as I was starting to feel like a climber again, my trip would be over, and I would have to start all over again. Nevertheless, I kept up my training, I kept focused on ensuring it was high-quality, and I knew I would have a chance to reap the benefits eventually. Prime Time to Shine is just one route, but the send is very special to me because it validates that belief I had in myself, and my training. A belief that I had to painstakingly protect and nurture through very trying times, when I was failing on much easier routes. Now I know that it wasn’t just foolish optimism; it was the truth. The training works, and you will improve; just give it time. If you’re struggling through a slump, keep working, keep training right, and stay focused on giving your best effort in every workout. It will pay off, and some day you’ll have that opportunity — that prime time to shine! Moments after sending Prime Time to Shine, 5.14b. Elated and a little relieved. Love it! congrats! I think most people (climbers), regardless of our level can relate to your efforts. Florida sounds like climber hell I have to say! I love redpointing and hope to send my hardest this year as well so thanks for the encouragement! I have sort of the opposite problem to you guys. Were I live, and my life situation, I can get on the rock quite a bit, and our season is long. Which of course is great however, I have found that progression has been slow. A letter grade a year on average. I’ve been following your guide this year but been having a hard time sticking to it as the weather gets better and my friends are calling me to go climbing all of the time. Life is rough, eh. So for example, finding routes that help me stick to my strength phase has been a challenge. The same will be true in the power phase but less so in the PE phase. A bigger problem here is we don’t have a gym but we do have a boulder wall that is quite challenging (think a moon wall type difficulty and angle) this is good for power and strength training but difficult to adapt to doing ARC type workouts. I can do about 7 min. on the wall. I haven’t tried the 4X4 linkups you suggested yet but pretty sure they will be hard to do as well. I have bought some bigger holds in hopes of making it a bit easier, but do you have other suggestion? Larry, yes it can be difficult to eschew climbing outside in favor of training, but you have to make a personal decision about what you want to achieve in climbing. To continuously improve, you must be willing to delay gratification a little while as you train. That said, a letter grade improvement per year can be quite good, depending on how long you have been climbing. For ARCing on a steep wall, consider leaving your feet on the ground, with intermittent forays back onto the wall. I have done this in the past with some success. Good luck! Sweet! Oddly, I’m climbing at primo this Sat, I’ll take my time to stare at the line in awe. awesome article mike, thanks a ton for posting it. this is the kind of article that can help a lot of us ‘lock in the hubs’ when the going gets tough. congrats on the send! That was just what I needed to read right now! After a disappointing year for me despite many months of hard and dedicated training (and the fall season being shortened due to a pulley injury), it’s so good to hear that it’s not the end of the world. I love the video of you working the route and the detailed description of the red pointing process. Cheers to your success! Anna, thanks for your comment, I’m glad I was able to give you a boost! Try to stay positive and think long term…a few years from now you’ll look back at this setback as a mino speed bump on the way to bigger and better things. Nicely done! How about a review of those Tarifas? The Tarifas are awesome, I absolutely love them! Climbing shoes are all about personal fit, and these fit my foot really well. That said, the design is important as well. The Tarifas have a nice amount of downturn and they are also very flexible and sensitve. These attributes make them great for overhanging terrain, gym climbing and pockets. The heel fits better than any shoe I’ve ever used, so they are great for heel hooking, etc. how about edging on vertical routes? Many thanks for such an encouraging and inspirational post Mike.